Well I’ll be a . . . What in the Wide Wide World of Sports is a goin’ on around here? That’s right . . . NEW STUFF! We begin now with a selection from Pendericki’s Threnody For The Victims Of Hiroshima . . . Hmmm. Perhaps that’s too dark? Nahhhh. Let’s roll with it. SO . . . First off let’s go with an unpublished black and white illustration of one of my favorite subjects . . . 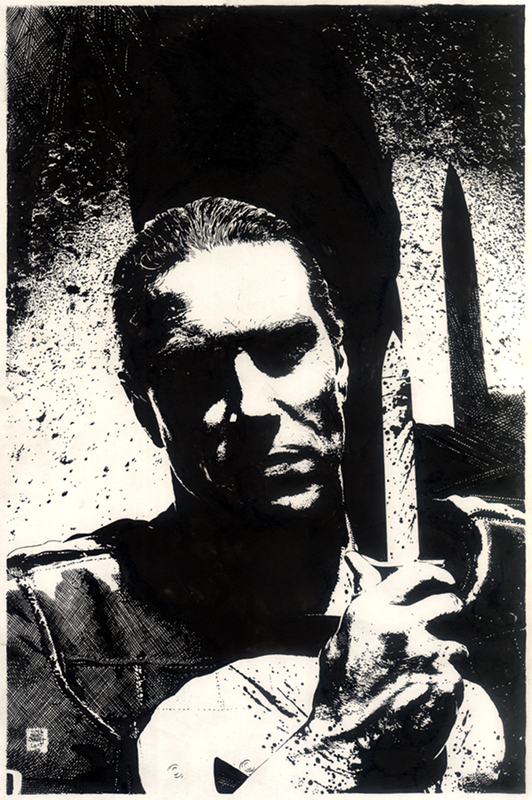 THE PUNISHER — How about a little off the top (2015) – Crowquill, brush, and ink on board. DIG! Damn, Tim. Miss the ol’ Street Punisher. Nothing compares. yay new stuff!! i’ve always loved your frank & this artwork is striking — a true visionary feast for the eyes!